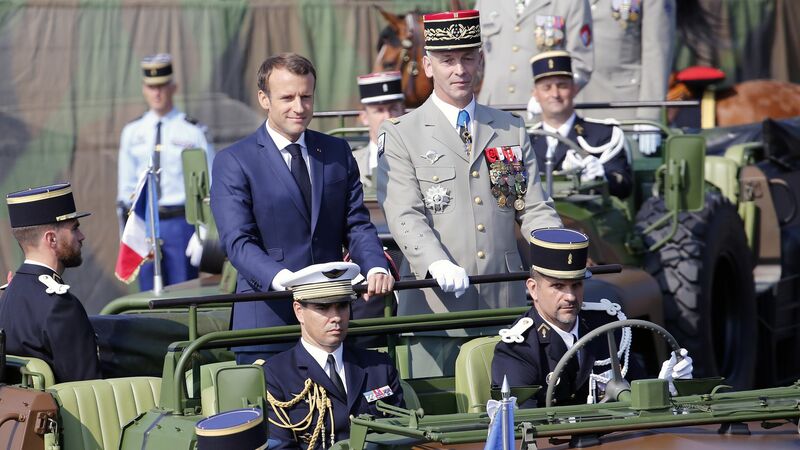 In celebration of Bastille day, which commemorates the invasion of Bastille prison in 1789 which marked the start of the French Revolution, President Emmanuel Macron awarded the French military with a budget boost for the following parade, reports the Associated Press. Timing: Ahead of Saturday's parade, Macron signed a new military budget with the intent to increase defense spending to 2% GDP. The move quickly followed a promise made by NATO countries to increase defense spending, an issue heavily pushed by President Trump. There was also a crash between police officers during the parade. Despite the errors, the parade continued on. Members of the 2e Regiment Etranger d'Infanterie de la Legion Etrangere marched on. Macron, his wife Brigitte and the rest of France gathered in Paris together with their military, as well as troops from Japan and Singapore. Lee Hsien Loong, Prime Minister of Singapore, was the guest of honor. Drones of the 61st Artillery Regiment parade past the Arc de Triomphe during the annual Bastille Day military parade on the Champs-Elysees avenue. In Nice, France French Prime minister Edouard Philippe arrived at a ceremony commemorating the 86 lives lost during a Bastille day terror attack in 2016.